The Centre is interested in hearing about both positive and negative experiences with UAV technology. What are some of the challenges that drone technology presented to your project, and what were your solutions – or what do you think the solution will be in the future? We are particularly interested in articles describing work carried out in Africa, the Caribbean, and the Pacific, although writing focused on other world regions will be considered. CTA hopes you will be interested in sharing your ideas and lessons learned from using UAV technology in the field with our readers. If you are involved in a UAV project or know of interesting UAV uses in our sectors of focus, please send us a brief description of the case for consideration. The deadline for submission of proposals is 31 December 2015. Chosen writers will be sent an article outline and a list of questions to be covered in the article. Final articles will be either 700 or 1200 words in length. 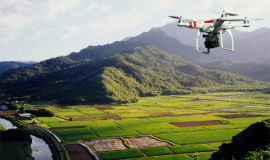 Additionally, please share with us any online resources, publications, papers, and reports related to the use of UAVs in farming, fisheries, livestock, and natural resource management operations. We intend to draw from a wide array of materials and resources for this issue of ICT Update. For more information, send an email to Ms Faine Greenwood: fainegreenwood@gmail.com who is conducting this research on behalf of the Technical Centre for Agricultural and Rural Cooperation ACP-EU (CTA). ICT Update is a bimonthly printed bulletin, web magazine, and accompanying e-mail newsletter focusing on the use of information and communication technologies in agriculture in African, Caribbean and Pacific countries. It is published in English and French, by CTA which is based in Wageningen, the Netherlands.